Property 56: Shibuya modern new wooden house!! OMOTESANDO - Nice and Quiet area. Central Tokyo!! Property 68: OMOTESANDO - Nice and Quiet area. Central Tokyo!! 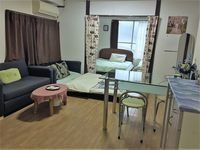 Property 69: Sunny living room with a separated bedroom close to JR train Station. ROPPONGI n NOGIZAKA Stations - TOKYO MIDTOWN Perfect Location! Property 71: ROPPONGI n NOGIZAKA Stations - TOKYO MIDTOWN Perfect Location! Property 72: Today's Relaxing and Fun Studio! Near Olympic Park! Property 77: Stylish and Chic Studio Near Olympic Park! YOYOGI Park and SHIBUYA Short Walk! Property 88: YOYOGI Park and SHIBUYA Short Walk! R4 Japanese Style Private Room for 2 Travelers. Property 90: R4 Japanese Style Private Room for 2 Travelers. Property 95: Olympic Park Near Shibuya 10 Minutes!